A Muddy Bike: Bike Lanes Everywhere! I've been working on this post for a while now. It started when I tweeted a link to a video explaining "Protected Intersections for Cyclists"
A novel (well not really, more on that in a bit) way of dealing with one of the most common complaints against Cycle Tracks in North America: What about the intersections? 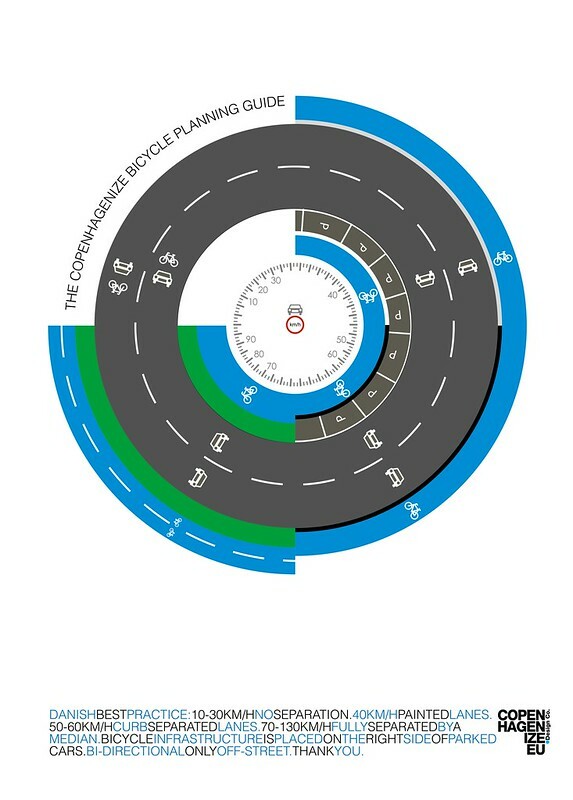 Quickly, while there are subtle variations, Bike Lanes merge with traffic prior to intersections & Cycle tracks continue to the intersection to the right of cars and stop. Both these strategies invite conflict with other traffic at right turns, red-lights and have short comings for left-turning cyclists. Here, clearly demonstrated, is a solution. Best part, this is not a theoretical solution. This is widely used, in the Netherlands of course. Why reinvent when others have already done all the hard work. The reactions: "It can't be done in Ottawa, takes to much room." "We shouldn't do this because then everyone will think that is the only place we can ride." The room issue is complicated, but ultimately false: Issue is never is there enough just how do you choose to use it. As Easy As Riding A Bike frequently takes this on in a British context. It is the second complaint that I've been trying to get a handle on. There are two sides to this: from cyclists perspective, a fear that Cycle Tracks will inevitably lead to a loss of right to the road. Non cyclists are often exasperated thinking we want CYCLE LANES EVERYWHERE! It is so elegant, so simple. Different provisions based on traffic speed and volume. Quiet low traffic streets, neighbourhood residential streets for instance cyclists of all ages should be able to share reasonably safely. Faster or higher volume roads get progressively more comprehensive infrastructure. Simple, no? I hate to be a sourpuss, but *as illustrated* that design would take up too much room for most of our downtown intersections. Basically we can't fit in the two parking lanes, which, at the intersection, turn into a large bulbout separator space. Just to be clear, it's not the lack of space for the parking lanes per se that is the problem, but rather the lack of space for the bulbouts at the intersection. This is easily seen in Ottawa on Laurier at Bank - Laurier has only enough room for three traffic lanes, the two bike lanes, the two modest sidewalks and nothing else. To create bulbouts, the centre lane would have to be removed or the bike lanes (and sidewalks and crosswalks) would have to somehow dodge out to the right at Bank. Thanks for your comment David, but I think you like being a sourpuss. The illustrated design is simply that an illustration. Check out this video: http://youtu.be/5HDN9fUlqU8 it shows the great variety of intersection forms this design can accommodate. 18m is plenty of space to have a safe road with Space for Cycling, It of course require different choices then if 20m available. Yes, I'm aware of that variant, hence my final comment about "dodges out to the right". But that version has come under criticism of a sort from none other than David Hembrow in Assen since it is used infrequently there! He recommends, well, it's not really clear, actually, since he can't seem to fathom the idea of relatively narrow roads existing in North American downtowns, much less that they'll have to have cars on them. I don't happen to agree with David Hembrow's frankly odd issue with that design, but in truth it does involve cyclists diverting from a straight alignment as they enter and leave the intersection. Is that a trade-off worth making to have a corner protection island? Or do we stick with the straight-ahead arrangement we've got on Laurier and try to make that work through other means? The problem with things that are "simply an illustration" and nothing more is that the traffic engineers will do as I have done and measure things out, discover it won't fit, and then pronounce that the way they've been doing it all along is in fact the way to go. It's best to anticipate the counter-arguments before they arrive and address them thoroughly before they're ever actually encountered. David I am glad I didn't put you off by glibly calling you a sourpuss. I'm not actually calling for/defending this infrastructure, in this post. It was a jumping off point to discussing fears some cyclists have of being confined to cycle lanes. Or the idea by a wider general public of advocates (like myself), wanting "Bike Lanes" everywhere. I feel, and I hope I made clear, that we should take cyclists into account EVERYWHERE but that shouldn't require bike lanes everywhere. I am working on a post that may more directly address the issues you have brought up. Hopefully I'll see your comments on it too.